am sitting here on New Year’s eve trying to think of something profound to say. The year is about to pass and there must be something good to say of 2011. Yes, there is: I made it. I had full expectation at the start of 2011. Each year I can only hope for a full remission so I can continue to experience the blessings of life. Thus, it is with that feeling that I say I am grateful I have made it this far. My friend, Noreen, wrote something wrote in her post here about being ‘Normal’. As she completed her therapy, our lives have continued. There are those who are still on chemo therapy, gone to vacations, got married, had kids, and passing of family and friends. I remember coming out of medical leave, twice, and my company is still there. Yes, life goes on like being ‘normal’. But it need not be, because you can make it special, unique, or even meaningful. I find joy in seeing people change for the better. Whether it is a change in diet, picking up for new relationships, or even taking up running. It gives meaning to all the bad days I endure due to chemo. Somebody is waiting for me out there and that is enough for me to get up and run my heart out. P.S. 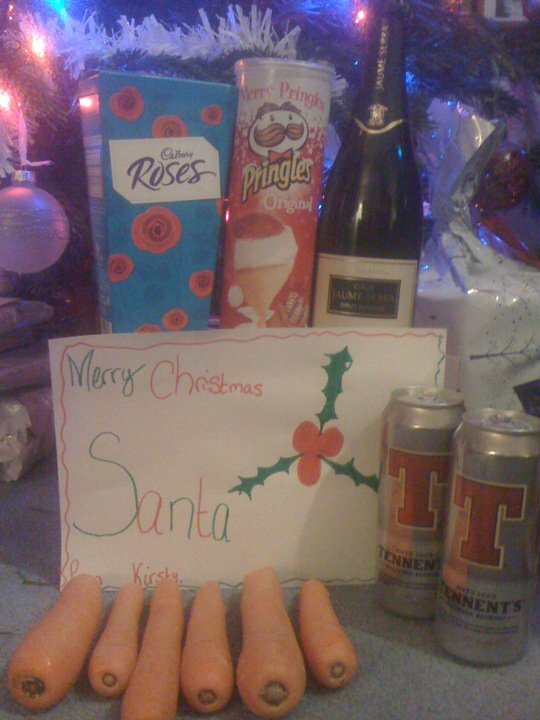 Skye, thanks for your Christmas post. Love the pics. Christmas means different things to different people, though I suppose sadly nowadays Christmas might not mean an awful lot to some folk. it was often a wonder that Santa and his sleigh ever got passed out house with all that lot waiting for him under the tree… But this year with my youngest daughter now 11 she announced that she knew there wasn’t a Santa after all so its kind of an end of an era – no more creeping around trying to fill the kids stockings without waking them up, finally getting to bed around 2am, only for the girls to wake at 2.30. You too??! This was taken last Christmas Eve after I’d been for an early morning run. The hat is NO indication of my thoughts of Christmas – I just felt that anyone that couldn’t raise a smile seeing me running round the village with a Bah Humbug hat should have been wearing one themselves. 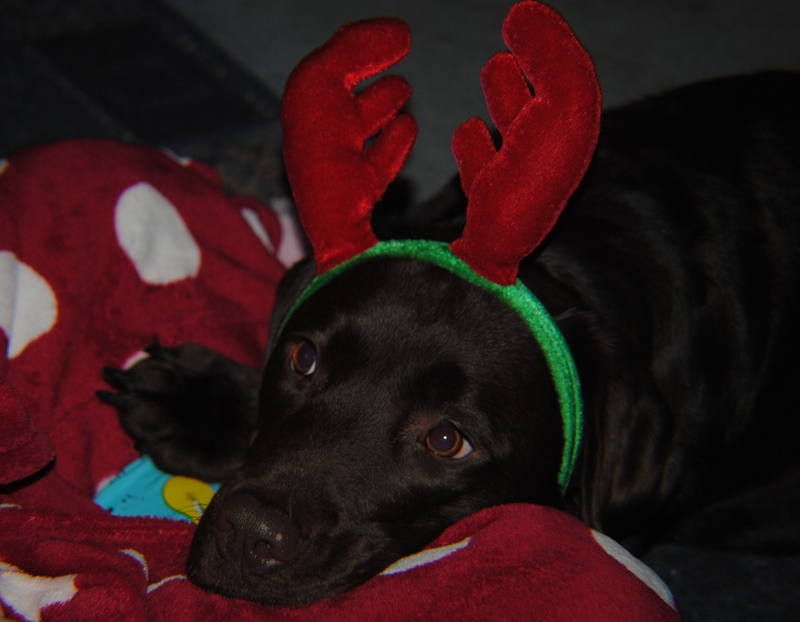 So, tomorrow I will be donning my hat again, while my running buddy will be wearing reindeer antlers and we will have a Christmas jog through the village in celebration of the days ahead. And even if you don’t celebrate Christmas I’d still like to wish you a Happy 25th December – have a wonderful day. ….and I am having chemo. What a crime!, as my friend and colleague Artie would fondly say. It is to describe a funny and ironic situation. My nurse told me “why don’t we move your treatment so you can celebrate your birthday.” Nope…and miss out on the fun? What difference does it make? It is the sh*t on a different day. Since being diagnosed with cancer, I sometimes jokingly tell my wife everyday is my birthday. Also, in the cancer world, my birthday should have been March 20, 2008 when I was first diagnosed with colon cancer; November 10, 2009 when it came back and affected my liver; July 29, 2011 again it came back affecting my lungs this time. Take you pick. So it does not matter. Everyday is my birthday. My plan is to push through with it tomorrow. In fact, I am going to start it by attending a spinning classes (aerobic exercise on stationary bike) 5:15 am at my health club. Afterwards, quick breakfast then go to my chemo treatment. That should keep me busy all the way to Christmas. I am sure the Grinch will be waiting for me in the hole but tough luck, Grinch, it will be just be temporary. I have completely accepted my situation. I will have good days and bad days. On good days I will continue to run and on bad days I will hang in there for you. Let’s get this party started. I invited Justin and Usher to kick it off, Noreen. Let’s dance. P.S. 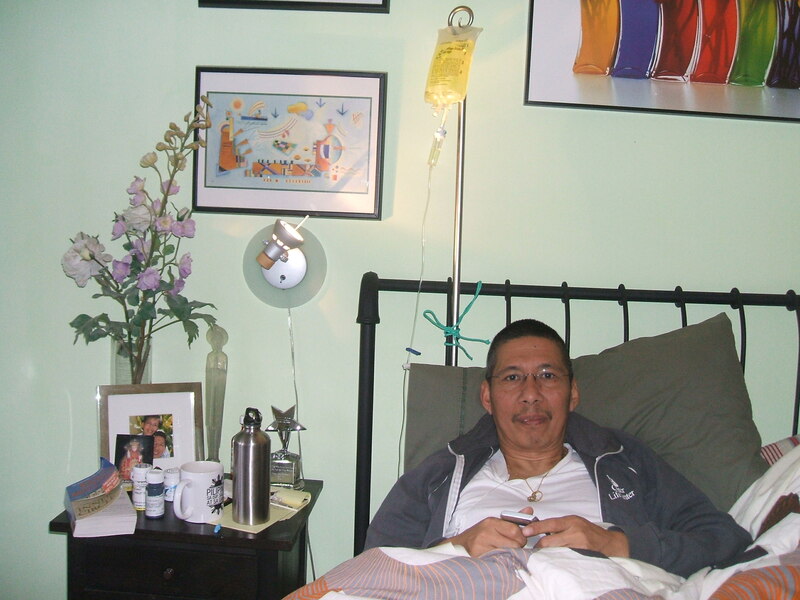 My thoughts and prayers to my cousin, Manuel, who started his chemo today for stage 4 esophageal cancer. Hitting the wall or the bonk is an expression among runners when you have totally depleted your energy or glycogen stored in the liver. Depending on your conditioning, it comes normally around mile marker 20 of the 26.2 miles marathon. It manifest itself with by sudden fatigue and loss of energy. It felt that way during my last chemo (round 3). I felt I have hit my limit and was struggling to continue. It was a struggle to eat or even decide what to eat. I just want to be left alone. It took sometime for me to recover too, inspite of the vitamin bag infusion. The cumulative effect of chemo is coming to bear; my hands are darkening again, few mouth sores are back, and the occasional nose bleeds. Skood (It’s good), as my colleague would say. I was able to run 3.5 miles the other day and it was good to be out even if it was cold. It is really a different feeling when you are out. Everything is alive. I suffer when I am on chemo but after, I fee reborn again. Food taste better. I savor every morsel of food to tease my recovering taste buds. I am also more attentive during conversations and very much aware of my surroundings. In short, I do not want to miss anything during my recovery week. Cancer does not rule my life. Life is really beautiful when you see it through the eyes of second chances. You can make it beautiful too. Beautiful is the Isle of Skye. Thanks to Skyetrekker (Vicki in real life), who covered for me and gave me a pull at the same time. Skye, your story of the American Cancer Society singlet brought back memories of the lost or maybe stolen singlet I sent to Hola (Sally) in Madrid. The postal carrier just gave her the package without the ACS vest. From there, she watches her carrier to see if he is wearing it around his route. Funny. Or when Emteess (Michael) would send me pictures of him wearing the singlet in UK’s historical landmarks. Amazing. I would like to think I am not the only blessed with good friends and loving family. Look around you. It is really up to us how much we welcome life at the same time push through our own ‘walls’. Think about it. I suppose that’s the wonder of the World Wide Web though – you get to ‘visit’ places and ‘meet’ people that 20 years ago probably wouldn’t have been possible. And, in a way the same can be said for running. It brings together folk from all walks of life – all abilities, nationalities, colour & religion can join together and just run. That’s how I first came across Bo. He appeared on the UK pages of a Health & Fitness blogging site but whereas most other Americans soon found their way back on to the US pages, Bo stuck around on the British site and it made a refreshing change for us to read about races & running on the other side of the Atlantic. He soon acquired a large number of readers to his blog and it was with great sadness we then began following his battle with cancer. It was written about with a huge amount of courage but also the humour came through as well, and before long we realised that Bo was fighting this all the way. We were amazed that he has kept running throughout his treatments and the positivity that shines through the blogs he writes is inspirational to us all. Various race shirts from the UK & Spain were traded for American Cancer Society running vests and worn for training runs and races throughout Europe, which I know got me some strange looks at times. The races Bo & Irish run are huge compared to the races I’ve taken part in (just anything from a couple of hundred up to a couple of thousand people) so I realise it looked odd to see a couple of ACS vests in amongst the usual race tops running in our little Island Half Marathons. My ACS top is still my lucky race vest. I got my Half PB (personal best) wearing it and I still remember the thrill of approaching the last corner before the finish line and realising that there was a possible pb. However it was a narrow path and there was a couple of runners just ahead of me that appeared to be in no rush to get to the end and I couldn’t get passed them. In my panic (and seeing the elusive pb slipping away from me…) I just yelled out the first thing that came to mind “PB COMING THROUGH”. They jumped pretty smartly to the side after that and the race photo I have has the 2 other runners laughing at me as I pass them… But my running, like my blogging has taken a bit of a dip since then. Injury & general apathy meant I kind of lost interest in both for a while and I’m hoping by Bo asking me to write this it might kick-start both again. here did November go? I couldn’t believe it is already December. I hear Christmas carole in the radio and of course lots of shopping ad. I wish time would pass quickly when you are on chemo. Tomorrow is round 3. I am better prepared. I have adjusted my diet to avoid constipation from the meds even before I start. I did some running and yoga to keep me fit. My demons (nausea and diarrhea) are creatures of habit. They have tantrums like a child if you don’t pay attention to them. I am prepared for them. In my last post, I mentioned my friend, Vicki aka Skyetrekker, sent me a calendar she and friends did for from her beautiful homeland Isle of Skye, UK. I asked her to post something for me while I am in treatment. She said she will. 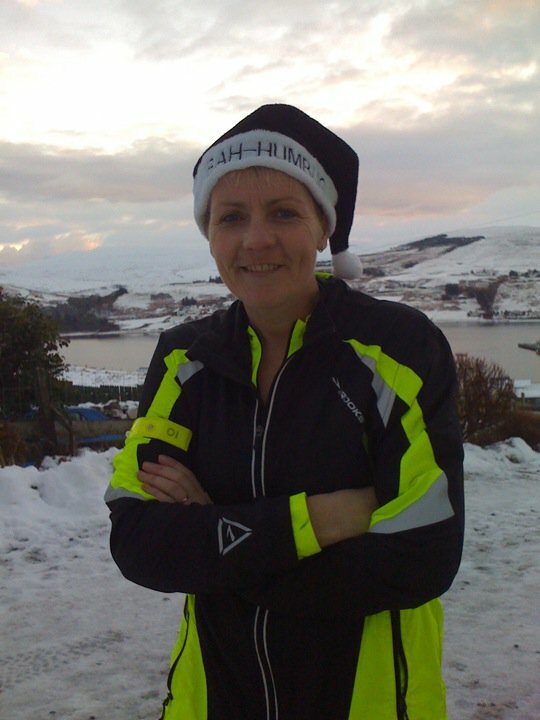 I followed her running blog and was very much amused by her adventures and Scotish humour. That’s how I met her more than three year ago. I have written about her too (see related post ‘I got buffed‘) and through her I learned about haggis (see related post ‘Dr. V (Part 2 of 2)‘). I have never met her but I feel connected to her. Someday I hope to meet her and perhaps run the Great North Run or London or the village where she lives. Please welcome her if pops in. “Hon, it’s happening again.” I said to her. “What’s happening again?” she said with a concerned look. “I am shedding again.” Then I laughed. It is like autumn’s arrival. I knew this thing would happen sooner but not just after the second round. I should be upset, concerned, or even vainly worried, but I welcome the moment. Ironically, it felt normal that’s why I had to laugh. I now belong again to a small circle of people; those living through cancer. Recently, my friend Noreen, who gamely contributed to my blog, completed her treatment. She looks forward to growing her hair and the return of her taste buds. I am happy for her and confident that she can dance her way through survivorship. She leaves the circle, I take her place. I know the road ahead will be full of new surprise even if I have experienced them before. I am just on my second cycle but some how this time around I think I am having…fun. I think it comes from my building curiosity on how to make most of the moment. I have visions of myself doubled over in the toilet, pale from vomit, with a smirk. Or getting bets from the family on how many times I have to go to the bathroom due to diarrhea. Call those brain fart moments due to chemo toxins fogging my brain, but I am lucid enough to know this. I have gone through the cycle of miseries, pity parties, and tears as I deal with my demons. Have used coping techniques of meditation, running, yoga, tai chi, etc. to get me through them. So what’s left? Having fun. I know I have strong support from you. Moreover, I know some are even willing to carry some of the load for me. I do not wish this on anybody. But think about this, if you see me having fun are you going to stop me? Don’t worry, this round I am recovering well and will be ready again for next week. I am getting tremendous support and care that I am able to bounce back quickly. PS: Vicki (aka Skye), thank you for early holiday gift you sent. I met Vicki, that’s virtually, through my blog and she lives in Isle of Skye, Scotland.